These pre-treated 2 inch squares are great for polishing or removing oxidation. Pads are tight-bond cellular foam with permanently bonded micro-abrasives. I love these babies. I go through 5-10 of them a week. You can use these pads until they are dark grey on both sides and then it is time to toss it and use a new one. Make sure the piece you are polishing is completely dry. If you get these pads wet, they get gooey and weird. These polish pads have made cleaning up after a Sharpie so much easier. These polishing pads can achieve a high shine with their micro fine abrasives. Downside is that I find these will dry out and get crumbly over time, keep them sealed in a baggie. I love these! I even use them with my Gliders Paste! These are amazing!! I love the size on these polishes great!! Used a sharpie? theses will make cleaning up easy!! These are great wish I ordered them a long time ago! These are wonderful! I used one to clean the ink from the design and it worked so well there was little ink trace left and the shine was wonderful. I also have used them to clean silver jewelry I have had for a long time and they work so fast and easy and restore the silver to its original beauty. I bought a pack for my daughter as all of her jewelry is silver. Keep them sealed and they last a long, long time. I use them for so much more than stamping. I ran out and tried using other polishers but had to stop and reorder and pick up where I left off after they arrived. Great for removing tarnish from metals as well as cleaning finished jewelry. LOVE IT! I like these pads a lot they work great really on all kinds of metal. I primarily use on my silver jewellery and my stamping. Works great. Will definitely re-order when i need more. The only polish tool I ever use - works like a charm on any metal! These are great. I go through them like water, so helpful. these are really good. great price. These things are genius!! I wish I could have a pad the size of a quilt! I use these to polish every piece in my house. Super easy to use, just use right out of the package. These are amazing!!! Wish they came in bigger sizes. I go through these like crazy and anyone I've given one too falls in love immediately. If you're a beginner and wondering if you need these...GET THEM! Seriously, best thing ever! Great quality and price here. Love these little pads, leaves such a nice finish!!! Love these! They make cleaning up Sharpie markers sooo easy and everything is SOOO shiny!! These are the best! These are a must have in my polishing collection. They work super and you can't beat the price. I always find such good quality products here and have become a big fan. Perfect way to finish off your finished creations! Absolute must have on my work bench! highly reccommend these for polishing all metals. I love these! They work great to polish up copper. I've been looking for an easier way to clean Sharpie off my pieces, and this is it! These pads are great. I used these on some nickel sized decorative thumb tacks, old brass darkened with years of patina .... Wow what a difference I have some in my purse , ya never know when you might need one. This is a staple on my bench..
Great product! Just the finishing touch you need to make your metal shine! These shine up jewelry beautifully. You can use them to clean copper, remove sharpie, or just polish to a lovely finish before shipping an item. Will order again. I've used these little pads to polish my non plated jewelry. I used it on my girls metal cuffs and necklaces. They were surprised at the difference, and now they ask me to clean and shine them.Thanks for these little wonders at such a great price. These guys get the job done! Beautiful shine and gets sharpie residue off with ease. A must have item on your shelf. Especially if in a hurry to polish, these will do the job. These are definitely a must have. I couldn’t believe what a difference they make! So shiny!! Everyone needs pro polish pads! Great product. Easy to polish with. So glad I found these. Leaves your metals witha great shine. These are an ABSOLUTE must for anyone stamping metal! Heard a lot of good things about these and had to try them for myself, so far so good! I honestly don't think I could live without these, they make everything so shiny!! I knew I should’ve ordered more! I’ve been going around polishing everything in the house instead of using them for my jewelry! Wondered why people rave about 'em. Now I know! Wow!!!! This product has saved me so much time with cleanup! I highly recommend it to anyone! A must have for my work table. Makes polishing soooo much easier. Brilliant product! These are magic. I used it on a very damaged piece of jewelry. The piece now shines like the sun. I need to order some more. Thin but durable! Fold them into small corners or run a chain through one. The only drawbacks- too small at times and the potential to dry out if not kept sealed. I ordered 50 this time around. I love using the Pro Polish pads! They help shine up my jewelry. I also like to cut them in fourths and send one home with each purchase of my jewelry. Clean up is easy with these babies! Love the shine they give! So economical! These pads are awesome. I use them for all my projects, even after applying Sharpie or Gliders Paint. They are a must have. I was pleasantly surprised at how well these polish metal! I use sharpie and it does the job! It does great at removing tarnish too. 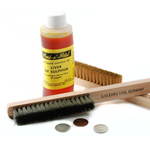 I use these after applying a patina, then a final polish with my Sunshine cloth. Great combo. These make clean up so much easier. I love how much quicker it is to get extra gilders paste off. You simply must have a large bag full of these handy at all times. They will clean up just about anything and bring a shine back to your pieces. Works especially wonderfully on sterling chain. But DO NOT get them wet! Even a tiny drop of water on a pad will cause it to become a sticky ball of goo. These are great for getting off excess sharpie or Jax darkener from aluminum and leaving the piece looking shiny. Recommend getting a large batch of these babies because you'll need it.